We were absolutely PACKED with animals the day Scooter was found and brought to us. We scanned him for a microchip, hoping to reunite him with his owner, but while he did have a chip, he had a tragic story to go with it. 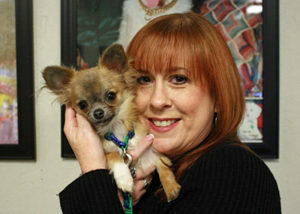 Scooter’s original owner had passed away, and he had been taken in by a relative – who was in the hospital on life support at the time and not expected to survive. The family member we reached asked us to put Scooter up for adoption. Before that could happen, this tiny boy had several medical issues that had to be addressed. He had awful teeth, which were expensive but easy enough to fix. 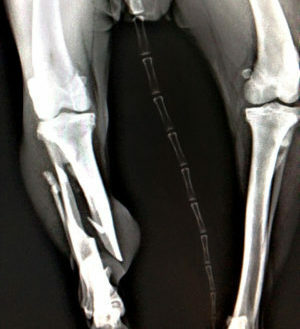 The greatest challenge, however, was orthopedic: Scooter needed surgery on BOTH of his knees to preserve his ability to walk! After a long and complicated procedure, and about 2 months of cage rest, we are happy to say Scooter made a full recovery – AND found a wonderful home! 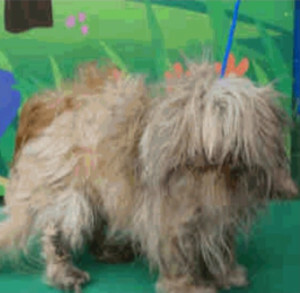 Peyton and Paisley arrived at the Waco city shelter together, and they were in such dire need of grooming, it was hard to tell that these were dogs and not gnarled mop heads! When we were asked to save them, we didn’t waste any time and brought them to Fuzzy Friends Rescue right away. The lack of grooming is not just a cosmetic issue – both had matting so severe around their faces that their eyes were developing ulcers. 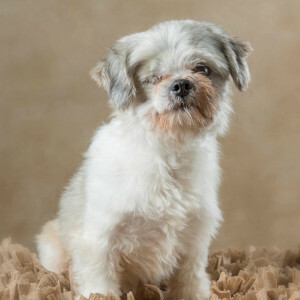 Sadly, Peyton’s condition was so advanced that one of his eyes could not be saved, and even with treatment, he will only have limited vision in his other eye. Paisley, the younger of the two, went directly into foster care and a strict regimen of multiple eye drops daily managed to save both of her eyes! Both of these babies have gone on to their forever homes. 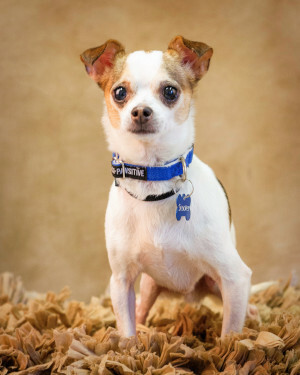 George is SUCH a spunky little dog! 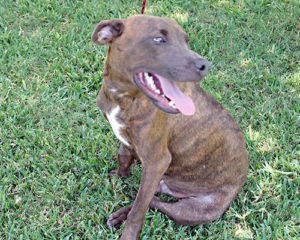 Sadly, his previous owner was in poor health and was unable to keep up with his care. 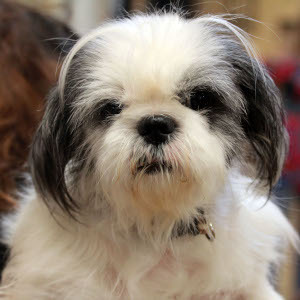 When George arrived, this little senior had lost most of his hair, needed to be neutered, and he tested positive for heartworms. George went through months of treatment and never once stopped smiling. It was no surprise that he was adopted as soon as he was available! Talk about breaking your heart, it is almost impossible to keep the tears at bay when thinking about Caroline’s story. This shy girl was picked up along the road to our facility. It looked like she had been dumped with her sister, though sadly her sister had been hit by a car before they were found. Caroline was depressed and we soon discovered that she was also suffering from life-threatening pyometra. 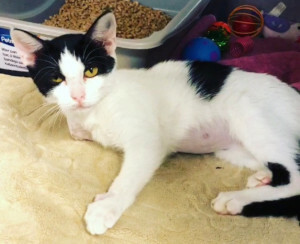 An emergency spay saved her life, and lots of loving care coaxed her out of her shell. Caroline also had some anxiety after being abandoned, which led to her damaging her teeth as she used chewing to calm herself. Her life was about to change for the better, though. 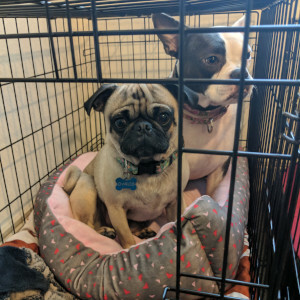 Caroline had dental work done and then got to go home with a saucy little Pug who LOVES playing with his new big sister! One of the scariest words in a dog lover’s vocabulary is “bloat.” Big, beautiful Patton had only just arrived when we noticed that his behavior was off. He was clearly uncomfortable and getting worse. Thankfully, our staff recognized the signs of bloat right away! 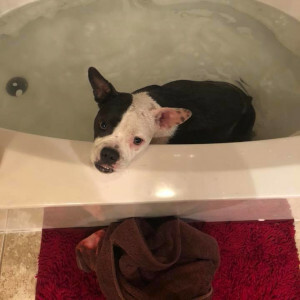 For anyone who is not familiar with the condition, some dogs can develop problems where gas becomes trapped in their intestines and if not treated quickly, can lead to the stomach twisting and dying. Bloat is an absolute emergency and can be fatal within a couple of hours. Patton’s stomach had started to twist, but emergency surgery saved his life. Only a short time later, he was smiling and greeting people like nothing had happened, and he quickly found a family to cherish. What do you call the kitten who blows in on a tornado? Dorothy, of course! Well, technically, there wasn’t a tornado touching down, but the tornado sirens WERE going off because rotation was spotted in the clouds right as the young lady who’d found Dorothy brought the kitten in our doors. Our cat intake was technically closed, but when we saw this little kitten with her badly broken leg, we knew we had to do what we could to help. 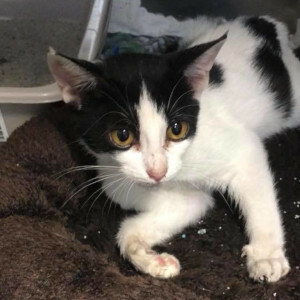 Dorothy was full of purrs, even though her leg was so damaged that the vet determined it was not savable. This little girl didn’t let that stop her! As soon as she was off her cage rest following amputation surgery, she was racing around the cat room and chasing the other kitties! And in a truly happy ending, the same person who had originally found Dorothy couldn’t stop thinking about her – and gave her a forever home! Just thinking about Eli puts a smile on the faces of everyone who has met him. Eli was found as an orphan, just a couple of days old. He went into foster with one of our dedicated bottle feeders, and even with the odds against him, this little boy thrived! 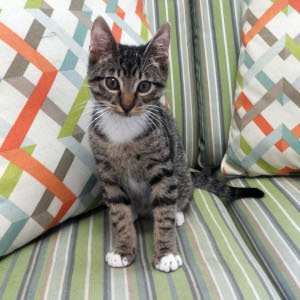 Eli had just come back to Fuzzy Friends Rescue to go up for adoption when disaster struck. We don’t know if it was genetics, or if he’d had some injury in his first hours of life, but Eli started having seizures. It took a few months of the vet trying different treatments to get him stabilized, but even then, many adopters were scared away. 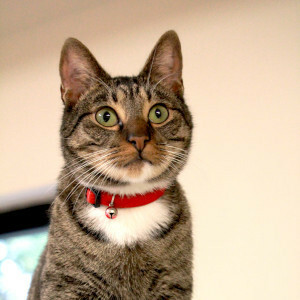 Eli spent his days in the kitten room, mentoring the new babies and running on the cat wheel. He waited, and waited, until one day an adopter who worked in the healthcare field decided to take a chance on our boy. Eli even got to take the cat wheel with him, and these days he is loving life! I don’t remember what it was that hit me, I just remember it hurt. A LOT. It was really hard to walk, but I had to move so I didn’t get hit again. I kept walking until I ended up in a park. I don’t remember much about that, either, but it was really cold. I tried to find things to eat and drink…I was starting to give up hope. I was so tempted just to lie down and not get up again. Just when I was ready to give up, a lady stopped and saw me! She was very sweet; she picked me up, and put me in her car, and I was able to get warm again. She gave me food! I still hurt, but I was so happy to have something to eat. She took me to see a person called a “vet,” and he said I needed an operation but it would cost a lot of money. The lady was very sad, so he told her I could probably live without it, I just wouldn’t be able to walk very well. 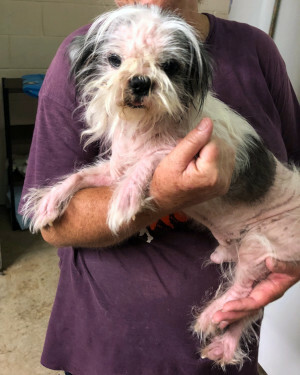 The lady decided I needed to go to a “rescue.” I didn’t know what that was, but now I do – a “rescue” means people who take care of you and fix your body so you don’t hurt anymore, then they find you a family! She called people, and they called people, and I ended up with some angels. 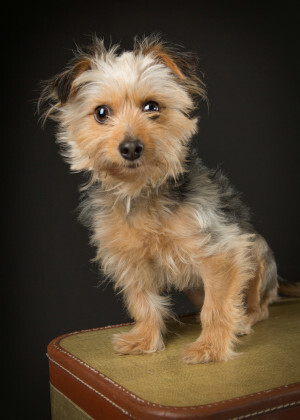 I was the newest dog at Fuzzy Friends Rescue! From the start, all the people I met told me I was a good boy, and they loved me, and they would help me feel better. I took a LONG trip to a special vet, and he took pictures of my legs. He helped me sleep, and when I woke up, I could tell my hips weren’t in the wrong place anymore! The vet man said he had never seen anything this bad before, but he was sure I was all fixed. I came back to Fuzzy Friends Rescue a new dog. I got to practice walking again and got to swim in a tub. When I was feeling better, I got to play with some other dogs. Best of all, when I was walking and running again, a family came and took me home! 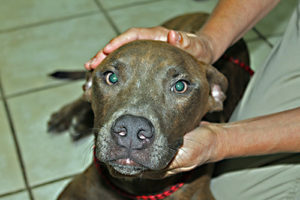 Three-month-old Oscar was thrown out like trash on Hwy 6 one February morning. A woman driving witnessed him being thrown out, and thought he was trash bouncing down the road. She saw him dart under her car and, out of fear for his life, pulled over to see if she could catch him. 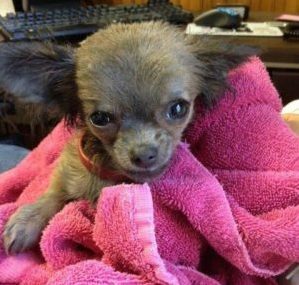 The two-and-a-half pound Chihuahua had been so terrorized by oncoming traffic that he bolted under the woman’s car and attempted to snip at her. At last, the woman was able to coerce poor Oscar into a box, cover him with a jacket, and bring him to Fuzzy Friends Rescue. After arriving at the rescue, the woman was too afraid to get him out of the box herself. The staff was able to coax him out as he was still trying to bite and viciously attack them. Oscar was so afraid, no one was able to get near enough to touch him without him going crazy. We all believed Oscar to be the first charcoal grey Chihuahua we had ever seen, but his coloring was due to him being so filthy. After a bath, he returned to his natural color, a light brownish tan. Oscar finally realized we were here to help him, contrary to his previous traumatic experience. Over the next month, he calmed down and let his true personality shine through. Oscar was adopted by a woman from Dallas, and he now lives with a Great Dane who is his best friend. 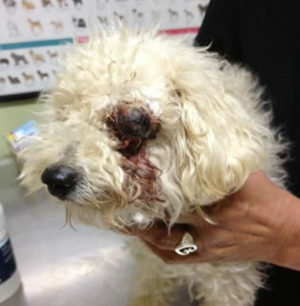 Gidget, a small poodle was owner-surrendered to the Humane Society of Central Texas in appalling condition. 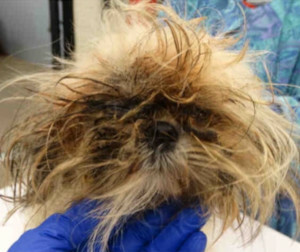 Not only did Gidget’s filthy and severely matted hair prove years of neglect, but serious trauma to her eye had caused her eyeball to hang out. To make matters worse, she was awaiting certain death by euthanization with the next few days, due to the severity of her injury. 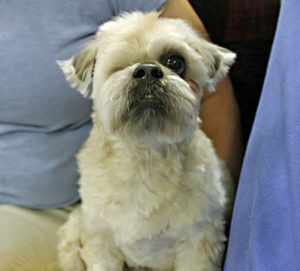 Fuzzy Friends Rescue pulled Gidget from the shelter, brought her in and surgically remove the damaged eye. She recovered nicely. The rest of the story is history, considering how amazingly short her stay with us was. A woman came in to find out more about our organization with no purpose of adopting another dog. Her husband was at his limit on pets and really had no interest in another one either. 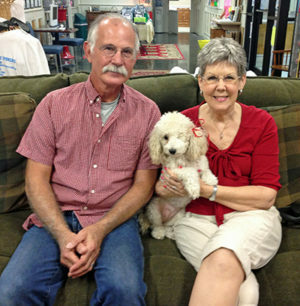 We had a feeling Gidget would be her perfect companion and thought it was worth a shot to see. It indeed was love at first sight, and she went home with the woman and her husband the same day. What makes the story even better is that the woman’s husband was a firm believer in “outside dogs only” before Gidget. Well, that way of thinking was thrown out the window after her arrival. She is now a beloved member of their family and is spoiled rotten. 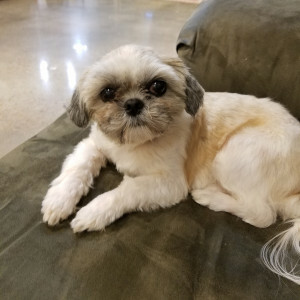 One afternoon Richland, a small Shih Tzu, was dumped at the Richland Mall and was spotted weaving in and out of traffic, and dodging between cars in the parking lot. After much worry from bystanders and a group effort capture plan, he was finally caught and taken to the emergency vet for an exam. Richland’s fur was so matted that it was almost impossible to tell what breed of dog he was at the time. 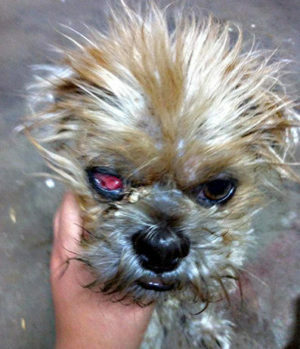 Due to lack of grooming, his fur was almost peeling his skin off, and his right eye was severely infected. Richland was shaved down to his irritated and raw skin, and it was determined that his ulcerated eye needed to be removed. A total of $500 was raised to fund his surgery and recovery. Some tender loving care is all it took to bring Richland out of his shell and into our hearts. He was adopted shortly thereafter and has been loving life ever since with his new mom! One Monday morning, we arrived at work to a startling sight—young Champ at our doorstep. We had seen him roaming Airport Road for some time, but he would never let anyone get close enough to catch him. While wandering he had become badly injured, likely from a run-in with a car, and was unable to use one of his back legs. He had tried very hard to make it on his own but finally found it impossible to survive without help. We cleaned him up, filled his growling tummy and took him to the vet so they could take a look at his leg. After examination, it was confirmed that his leg was broken in two places, and one of the breaks was an old fracture that wouldn’t ever fit back together. 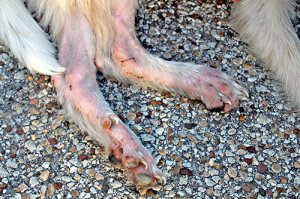 His leg would need to be amputated, and the surgery to get him back on his three feet would cost approximately $1,000. 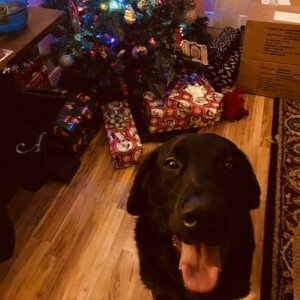 Thanks to your generous donations, we were able to fund the surgery for Champ, and throughout this process Champ has remained a gentle soul, happy to be in caring arms at last. 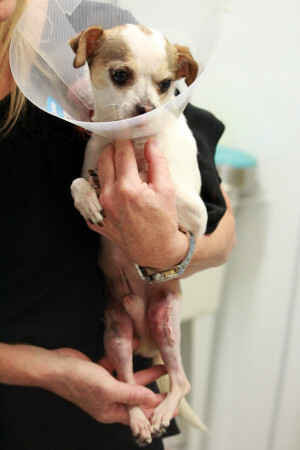 He is expected to make a full recovery and is back at Fuzzy Friends Rescue. Lucky for him, he is one smart dog, and knew where he could get help! After a long time wandering, he brought himself to our rescue. 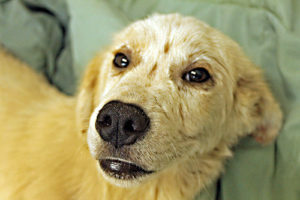 Early this summer, Ricky, a young retriever, was dropped off in the country all alone to fend for himself. All he had was a bag of dog food that was thrown on the ground. 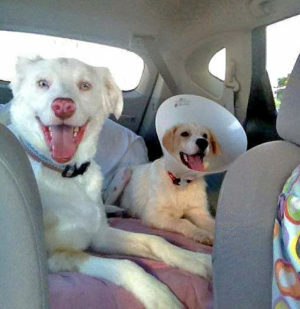 He’d been hit by a car and was found injured and struggling but still happy to have human companionship. 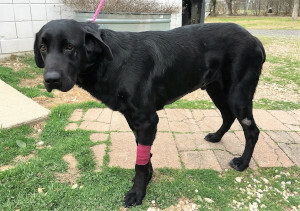 Thankfully, a Good Samaritan brought him to Fuzzy Friends Rescue in hopes that we could help save this sweet boy’s life. Ricky was diagnosed with a broken femur that required surgery to heal his leg, and he was treated at the Hewitt Veterinary Hospital. Cost of his surgery was $1,000. He has since been resting in a foster home so he can recover comfortably. Today, Ricky is doing great, and his leg is almost completely healed! It’s through your donations that we are able to provide this type of medical care to dogs and cats like Ricky. 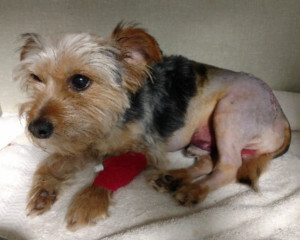 He wants to thank everyone for donating to his care, and sends his love to everyone who has been following his story.